Problem: Congestion, pollution, climate change, escalating gasoline prices, and a dependence on foreign oil illustrate the misapplication of automobile technology in cities. Automobile alternatives are unreliable, time consuming, comperable gas hogs, and their infrastructure, like lightrails, turn into expensive and ongoing projects. Intent: Repeat the successful re-tooling of communications infrastructure (analog to digital to wireless) in urban transportation infrastructure displacing 70% of oil-powered transport with JPods Networks that are 10 times more efficient per unit of economic work. Reduce US oil needs to within domestic production capacity and powering urban transportation within a solar budget by 2020. Objective: By 2022 JPods, allies and competitors profitably displace 70% of urban oil-powered transport with networks 10 times more efficient, creating 5 million jobs, increasing disposable income by $5,000 per family, building economic lifeboats in the communities we serve. Concept: This is a gigantic task. Take the ant approach to eating an elephant, small bites, lots of friends. Start small, in niches where the automobile is inconvenient, where there are a lot of shuttle vans where paybacks are less than 3 years. Do not solve the world's problem, solve someone's problem. Iterate relentlessly. JPods - create the technology - currently workable. Need manufacturing base, additional engineering. Currently we have $300k to get building permits. Raise $20 million and begin construction of Kitty Hawk Networks. Sell networks to Local Mobility Companies for $40 million. Establishing the model similar to the Transcontinental Railroad deployment and that re-tooling is profitable. JPods -put into operation the Kitty Hawk Networks, shifting the paradigm in urban transportation. All - on going - Rally allies to lead an effort to build a economic lifeboat for their local community in vast numbers. All - on going - Like the Internet and cell networks, incrementally deploy networks. Iterate relentlessly. We have a passion for self-reliant, on-demand personal mobility, as it is the physical manifestation of freedom. We can be the best in the world at creating networks for moving people and cargo on-demand, in dense urban areas, for distances between 200 meters and 30 miles, with payloads less than 1200 pounds. We will finance our networks by having significant profit per customer trip. Our infrastructure and operational costs are drastically less expensive than conventional urban transportation methods, so we profite despite providing an affordable alternative. Private capital free to innovate, pick best network locations based on payback and operate with Lean Thinking. Sell networks constructed weekly to Local Mobility Companies (LMC's). Similar to ISP's for the Internet, these will be primarily locally owned company that will operate the networks for profit tuned to the needs of the local market. Organize bonding mechanism to support the LMC's purchase of networks. So the bonds are paid back from farebox sales. Create government backed bonds where network operations support public policy objectives. The Transcontinental Railroads provide a historically successful case study. The book Nothing Like It in the World provides good background. Calculate economic impact on a community based on changes in gas prices. Excellent documentary on oil logistics. Communications by publish is more reliable, persistent and accessible than messaging via email. Resources are provided for collaborating via pubishing on the web. Secure features and individualized features can be added as needed. Here is a link to references to the facts stated in this email. Here is link to a forum page where comments can be added by the community. Good to Great by Jim Collins, how to change an organization from being good to greatness. The Stockdale paradox of unwavering faith we will prevail while facing the most brutal facts of the current reality. The flywheel principle of incremental, yet relentless improvement. Nothing Like It in the World by Stephen Ambrose, how the Transcontinental Railroads were built. Private construction capital (risk on the innovators) reinforced by government backed bonds once networks were in operation and achieving public policy objectives. The Black Swan by Nassim Taleb, how to make decisions without being the turkey, dealing with uncertainty. The turkey wakes everyday to kind feeding by humans. Everyday its experience reinforces that life is stable and good; just like oil. "Empty suits" the experts who aren't. The Tipping Point by Malcolm Gladwell, how change happens. Outliers by Malcolm Gladwell, who makes the changes and the decade of preparation required. JPods has our decade of preparation. The Wisdom of Crowds by James Surowiecki, Why free markets and democracies work. The transportation section underscores why customers are better than experts at designing what customers are willing to pay for. Positively Outrageous Service by T. Scott Gross, on why companies that listen to their customers succeed. The Crash Course, Google "Chris Martenson". The course is free on the Internet. Innovate Like Edison by Michael Gelb and Sarah Miller Caldicott, little contrived but great quotes and background on tinkering process of Edison and his team. Einstein and His Universe, institutional resistance to changes from the current "know-how" to a different "know-what". Despite a massive mail campaign seeking a teaching job, took 4+ years after publishing the Special Theory of Relativity and Proof of Quantum Mechanics and proof the atoms and molecules for Einstein to get a teaching job; it is easier to change physics than to change minds. PB-244854, Congressional Office of Technology Assessment study that is a blueprint of oil independent cities, 1975. It also warned "Finally, institutional failures may have hindered implementation." Background: CSX railroad commercials note how they "move a ton 423 miles on one gallon of fuel." Freight rail averages over 400 ton-miles per gallon because they operate on efficient rails and do not repetitively start-stop. So, if we know it is practical to move a ton at 400 miles per gallon, why do we move a person at 18 mpg? Stockdale Paradox: Unwavering faith that we will prevail while facing the most brutal facts of our current reality. From the book Good to Great in reference to a conversation with Admiral Stockdale about what was required to survive the Hanoi Hilton. The lesson also applies to changing organizations from good to great. Gas milage is the same as the Model-T.
Congested, costing each person about $434 per year (AAA). Safety should be regarded as unacceptable. We would not fly with air line company with the safety record of government highway networks. Urban transport is less than 1% efficient relative to what we know is practical with free market freight rail. Highway-oil subsidies incrementally undermined railroad networks resulting in the abandonment of thousands of miles of railroads. 60% dependence on imported oil is a Potato Famine addiction, risking the survival of the nation. Jobs to build infrastructure paid for by oil savings. Increase disposable income by saving families a car payment per month. Article on disposable income and oil prices. 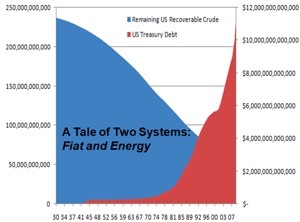 National debt soared as oil reserves depleted. .
Maintaing the oil-powered infrastructure through 2020 will cost between $27 and $57 trillion (IEA & Congress). We seem almost blind to geologically slowly approaching crisis. The facts of Peak Oil have been known since 1956 and proven since US Peak Oil in 1970. Admiral Rickover warned of this in 1957. 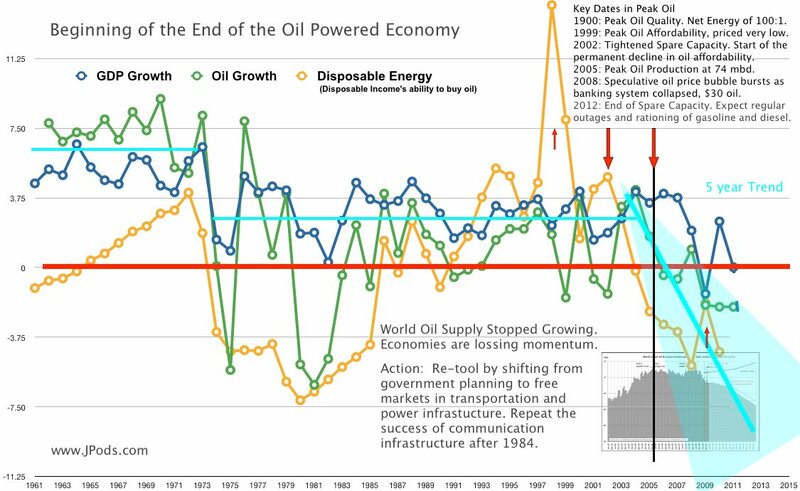 Peak Oil is not the end of oil. There is plenty of oil left. Peak Oil is about the size of spigot. The second half of oil fields are much slower to extract than the first half. Add up all the oil fields in the world and we went into the second half in 2005, peaking at 74 mbd. Conventional crude oil yields 20:1 net energy (energy available versus energy required to get energy). Oil sands yields 3:1. Oil shale 2:1. Biofuels 1.1:1. Both quantity and quality matter. Economic Growth based on Oil Supply Growth ended in 2005. Correlation for the past 50 years shows 3 distinct patterns. Oil Supply Growth (Green) is available power. Disposable Income (Gold) illustrates economic work. Economic Growth (Blue) is momentum. Oil production peaked in 2005 at 74 mbd. Disposable Income and Economic momentum has been decaying for the past 5 years. Projecting that momentum over the next 5 years indicates the risks and reason to become self-reliant. Small, lower right insert graph shows World Oil Production. Below is a larger version of this graph showing Production and Net Energy available to power the economy. The economy is powered by energy. Oil energy and the net quality of oil are deleting faster than new fields can be found and developed. We have known this would happen for half a century, but central planning and subsidies distorted people's perception and how we cause markets to adapt. Aware of daily feedings, the turkey is comfortably unaware of Thanksgiving; people are unaware Peak Oil. Unstable oil prices were our last warning. Oil will be back to $100 by summer. By 2012 our third largest supplier, Mexico will deplete below their domestic consumption. Mexico's fields are depleting at 8.9% per year. We are heading back to the per capita energy available to the World War I generation. The good news is they did just fine living within a solar budget. The bad news is they were tooled to live on the energy equivalent of 3 barrels of oil a year; we are addicted to 25. Re-tooling, we can have 10 times the energy efficiency and service of pre-World War I people. Think of the better service and lower energy of cell phones to Bell's analog networks. Just like the reduction in communication costs from innovation, we can increase working families disposable income by $5,000 by cutting transport costs in half through network innovation. Currently, we seem blind to geologically slowly approaching civilization killers such as of Peak Oil. Government socialization policies protected from competition century old transport and power networks . We have an interesting choice to cut energy consumption 85% per passenger mile or nature will cut the number of passengers by 85%. Economic Lifeboats: The solution to global economic, political and environmental problems is local action -- become self-reliant in your local economic community. Lifeboat paradox is that if every community has one, they will not be needed. Preempting waste is profitable. Profit is necessary so action adds strength for more action. Iterative process. Personal Rapid Transit (PRT) or Podcars was a solution calculated to solve the 1973 Oil Embargo (Congressional Office of Technology Assessment Study PB-244854). A heavy weight PRT network opened in Morgantown, WV in 1975 and has delivered 110 million injury-free passenger miles. Modern networks at Heathrow, Upsalla and Masdar. JPods patented an improvement to PRT on the use of distributed collaborative computer networks to move physical packets. "Sunshine is spread out thin and so is electricity. Perhaps they are the same, Sunshine is a form of energy, and the winds and the tides are manifestations of energy." There must surely come a time when heat and power will be stored in unlimited quantities in every community, all gathered by natural forces. Electricity ought to be as cheap as oxygen...."
Solar and wind quality, Net Energy, is very potent. Most organism on Earth live within a solar budget. But listening to central planners and power experts disparage wind and solar energy is amazingly similar to listening main frame computer experts talking about Personal Computers in the 1980's. As a distributed, collaborative network of these devices grows it will be as amazingly efficient as the distributed collaborative network of small devices that form the Internet and cell networks. JPods has a number of patents to submit in this area. Germany's Feed-in Tariffs (FIT's) unleashed small business innovation in power generation. Vast numbers of jobs and power are being generated because small businesses can adapt to exploit small niches that large central power plants cannot address.